The Achillion Palace is undoubtedly one of the most famous royal mansions in Europe, attracting locals and visitors from all over the world. It was built in 1890 by Empress Elizabeth of Austria and was designed by the Italian architects Karitto Raffaele and Antonio Lannti as a mansion that would help the empress to recover at a time when her health had considerably worsened. The villa was dedicated to Achilles, giving the palace its name. It~s surrounded by lush gardens with bougainvillea vines in intense colors and towering palm trees. The experienced traveler won't find it difficult to locate the statues representing figures like the "Dying Achilles", an impressive bronze statue of the German sculptor Ernst Cherter. With a height of 11 meters, it shows Achilles trying to pull the arrow of Paris out of his heel. This statue was built in 1884 and it's assumed that Elizabeth of Austria bought it after the tragic suicide of her second son, the Archduke Rudolph, in Mayerling. The figure of Achilles is also represented by a second statue, that was an order of Kaiser Wilhelm II, who placed the inscription "To the greatest of the Greeks from the greatest of Germans." 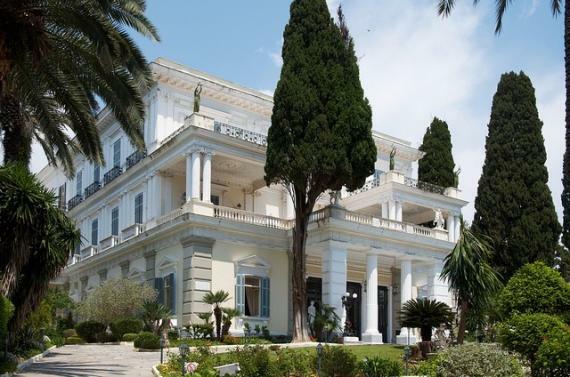 The palace is located only 9 kilometers east of Corfu Town on a wooded hill. It's a Pompeian mansion built between 1889 and 1892. A basic feature is the multitude of statues depicting figures of the Greek mythology and heroes of the epics of Homer. Placed in the village Gastouri, it's hidden among olive groves and the lush nature of the island. Among the impressive statues of the sight are the Olympian gods and the colonnade of the Nine Muses. Rare archives, historical documents, family photographs, rare books and souvenirs revive the past of the palace. In particular, 33 photos of the German Emperor William II and his family members stand out. Between the photographic documents, the arrest of the killer of Elizabeth is distinguishing. The museum also hosts typed notes on the organization of the household and handwritten notes on the program of yacht trips. Don't miss the rare books from the collection of Elizabeth and the medals from events of the time. Additional sculptures include 17 copies of ancient works, reflecting Elisabeth's love for the ancient Greek civilization. Among these, try to locate the "Resting Hermes," from the second half of the 19th century. It is said that caressing his leg brings luck to the visitor. Also don't forget to spot the bronze replicas of the two "Palaistes- Runners" from the Archaeological Museum of Naples. It's worth noting that the palace was bought by Kaiser William II in 1907 who significantly changed the internal layout while the building had to face major damages during the World Wars. After its restoration, the palace opened as a museum in 1994. The bronze statue of Zeus and Hera adorn the entrance of the Achillion. Once you enter, among the first things that will amaze you, is the portrait of Empress Sissi next to the luxurious fireplace. Take a look up to the fresco of the roof with the works of Galoppi, an allegorical portray of the "Four Seasons". Also look out for the Catholic Chapel of Elizabeth as well her private hall with a collection of personal furniture and objects.